Weird Sports #2: We had sticks. We fought. I lost. The second story in my series on weird sports aired today on The Madeleine Brand Show. It’s all about me getting beat up by a big, tall guy with a black belt. 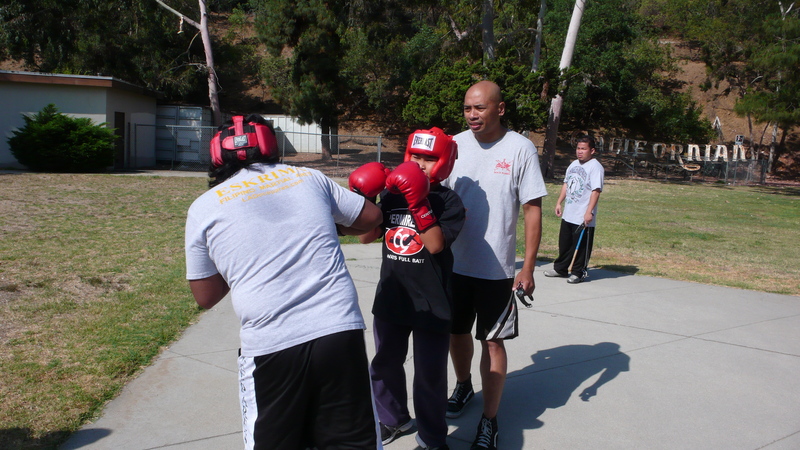 I discovered eskrima after driving past the classes on Riverside Drive, near Griffith Park. I was on my way down to San Diego, and I saw them attacking each other with sticks, and I thought, “What the hell?” I knew I had to do a story on them, so when I pitched the Weird Sports series idea, I made sure to include it. They meet early in the morning on the weekends under a flagpole next to a dilapidated “Californian” sign. Students learn to fight with sticks, knives and bare hands. Clearly Filipinos are not a population to mess with. Participants leave their sticks behind for a moment to practice boxing. I grew up doing martial arts. I didn’t do anything impressive with it – no blackbelts – it’s kind of like how other kids do AYSO soccer or little league. I did Tae Kwon Do, so I thought I was ready for the class. During warm ups when we were kicking and punching, I was doing just fine. “These guys aren’t nothing!” I thought. And then we started using the sticks.